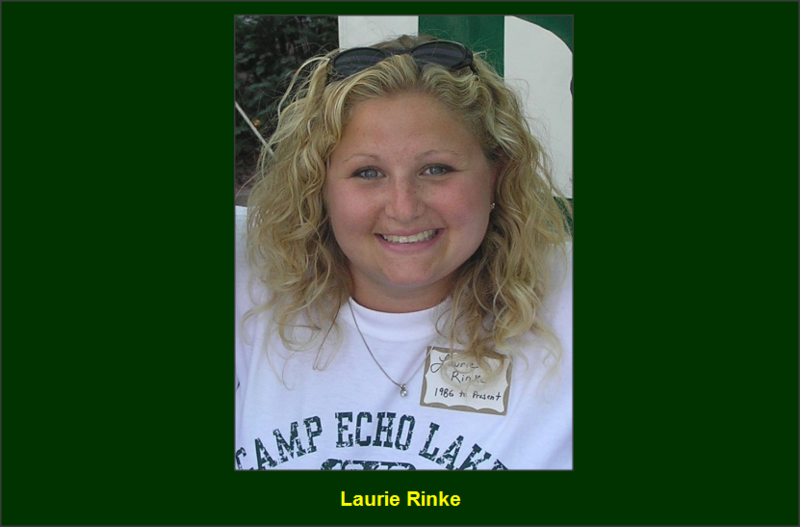 Laurie is a Camp Echo Lake lifer who bleeds green and gold! She started out as a camper in 1986 and has never left, rising steadily up the ranks from Cabin Specialist all the way to Director. In addition to her vast camp experience, Laurie has a degree in Psychology and Education and a Master’s degree in Social Work, making her imminently qualified to ensure the well-being and development of all Echo Lake campers. Laurie has been honored with both local and national awards for her work with EPIC (Emerging Professionals in Camp) and in the camping industry. She was the 2012 Chairperson of the ACA NY-NJ Joe Kruger Youth Development Conference, which focused on “Tweens, Teens, and Everything in Between,” and was recently elected to serve on ACA NY-NJ’s Board Of Directors. She is the current co-Program Chair for the Tri- State Camp Conference (the largest conference for camp professionals in the world – over 3000 attendees). My parents wanted to find a great summer camp where I could grow and thrive. They also wanted a camp where my younger brother, younger sister and I could all be part of the same shared community experience. The values of Camp Echo Lake matched our values as a family. This will be my 29th summer at Echo Lake. I started as camper in 1986 as an Upper Junior. Prior to coming to Echo Lake, I went to a one-month, all-girls camp, but it was not for me. A good friend of mine went to Echo Lake, and I joined her in 1986. Morry Stein came to my house to meet us with a slide projector; that’s how I saw Echo Lake before coming here. Back then, there were no summer tours, DVDs or camp videos yet. I was a camper from 1986 to 1992 (as a CIT, currently called an LIT) and Mohawk Tribal Chieftain. I was a Cabin Specialist for two years and a Group Leader for three years, all of which were in the Main Village. In 1998 and 1999, I was on the head staff as Senior Village Program Director. In 2000 and 2001, I was the Program Director for the entire camp. I started working full-time for Camp Echo Lake in September of 2001. I was the Girls Camp (for both Juniors and Inters at the time) Head Counselor from 2003 to 2006. Since 2007, I have been the Main Village Director (overseeing the four Main Village Head Counselors). From 2006 to December 2012, I was the Associate Director, and in 2012, I became Tony’s co – Director of Echo Lake. Formative and magical! I am still close with my best camp friends from when I started as a camper. I feel like the connections that I have made with peers, campers, staff and parents over the past 29 years have been invaluable. Camp Echo Lake helps each camper and staff member feel valued and important as they build life skills, form connections with others and become an important part of our overall community. We help each camper and staff member set higher expectations for themselves by teaching them the importance of self-respect and respect for others. We give campers and staff members alike, the opportunity to try new things and improve upon their skills. By the time that the summer ends, this experience of a lifetime changes everyone for the better. Prior to working full-time for Echo Lake, I worked as a Family and Child Therapist and a School Social Worker. Since becoming a full-timer, I am very involved with Echo Lake’s camper recruitment, family home visits, staff hiring, staff orientation, camp families and all aspects of making camp the best possible experience for everyone. I am very active and involved in the American Camp Association, both locally and nationally. I am the creator, founder and former Chairperson of EPIC (Emerging Professionals in Camp) – an American Camp Association-NY initiative designed to support the careers and professional education of developing camp professionals. I do cardio kickboxing multiple times a week. I have a Lhasa Apso dog named Jake who loves coming to camp with me and going on walks with campers. I love to spend time with family and friends and often travel to camp on weekends during the winter. I go to concerts and see live music as much as possible. I enjoy movies, cooking and have a passion for photography. What are your favorite activities at Camp Echo Lake? As a camper, my favorites were definitely dance and theater. Because Echo Lake has been such an integral part of my life for so many years, it is very hard to narrow the memories down to just a few, but there are some that really stick out in my mind. When I think back to my camper days, often times the unexpected, mundane moments are the ones that stand out the most. I remember spending time in my cabin when it was raining and doing dance parties and our version of a fashion show, with crazy outfits and underwear on our heads. Those were some silly times with tons of laughter. I remember one day, in particular, as a Cabin Specialist. There was a big storm coming in, so we all headed back to our bunks. It was an incredibly hot day; we propped the door open and sat right in front of the opening for some air (we didn’t have ceiling fans back then). One of my campers was sitting on my lap as we watched out the door. All of a sudden, everything turned eerily calm, and then it got very windy, and the trees started bending and swaying. We watched the storm pass from one side of the soccer field all the way across to the other side. There was a loud clap of thunder and bolts of lightning lit up the sky. The camper, from Manhattan, said…“It never rains like this in NYC.” Obviously it does, but she had never seen a storm like that in her entire life. The moment had such a profound impact on both of us. I have so many great memories from my 4n4 trip out West. We shared incredible moments together, and saw amazing things. Seeing the Grand Canyon with my friends was awe-inspiring, but that’s a story for another day. As amazing as the sightseeing was, the most special moments may very well have come while travelling together in the van. It gave us the chance to really talk and get to know each other in a deeper way than ever before. We would sing songs at the top of our lungs. To this day, “Don’t Stop Believing” by Journey still brings me back to that point in time.